Shree R catering company provide a corporate catering all over gujarat. And event management. We provide a many types dishes like a. Rajasthani Gujarati Punjabi. We are providing Industrial Catering Services. 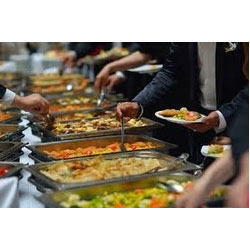 Appropriate catering as per requirements..
We are providing our Corporate Catering Services to our customers. Our customers can avail from us orders for breakfast, lunch and dinner of any volume as required by corporate houses and offices. Our experienced and expert chefs and other personnel are highly proficient in handling various corporate parties and events. Let us make the most of your time by helping you plan your next business event. We offer full service business catering and event planning for all your business needs, be it a company picnic or a conference. Breakfast, Lunch and Dinner are served to the visitors and staff along with a variety of contemporary and traditional snacks in the cafeteria. It is operated 24/7 and an abbreviated menu is offered between 10 pm and 7 am. Fast moving packaged snacks, soft drinks, ice-cream, packaged juices etc are made available at all times.